Level 11 Update: Wow, This Tournament Is Really Moving! Ben Grundy moved all in over the top of Alex Keating’s 3,800 preflop raise for his last 31,000 and Keating made the call, showing pocket tens. Grundy was well ahead with pocket kings, but the board fell A-10-4-6-2, giving the hefty pot to Keating. Vladislav Varlashin moved all in for his last 14,800 holding A 7 and Team PokerStars Pro Chris Moneymaker made the call with A Q . The board fell 6 5 4 J 9 , giving Moneymaker a scare, but he ultimately took the pot and moved up to 186,000 in chips. Thierry Van Den Berg raised to 4,000 and then called all in for his last 29,000 when an opponent shoved. Van Den Berg was racing with A K against his opponent’s pocket deuces, but failed to connect on a board reading Q J 9 3 3 . Liz Lieu got it in with pocket kings on a Q 7 6 flop and it managed to hold against her opponent’s pocket jacks. The turn was a king and Lieu raked in the pot, bringing her stack to just over 50,000 in chips. Recent EPT Champion Liv Boeree took on a fellow EPT Champion in Salvatore Bonavena and came out on the losing end. Boeree raised to 3,700 and Bonavena reraised to 10,600. Boeree moved in and was snap called by A K . Boeree showed a dominated A J and missed the 9 7 6 5 10 board entirely. After a preflop raise, David Williams, Nenad Medic and a third player saw a flop of A 2 9 . David Williams led out for 6500 and was called by Nenad Medic. The third player got out of the way and they saw the turn heads-up. The turn card was the 8 and both players checked. The river card was the 10 and both players checked again. Williams showed J 10 4 4 , which meant he had flopped a flush, and Medic mucked his hand, but not before revealing two aces in his hand, showing that he had flopped top set. Gabriellson tabled K K A 3 , which was ahead of Grundy’s K Q Q 10 . Grundy needed to hit a diamond to stay alive, but the 8 on the river sent Grundy home. Gabriellson now has over 500,000 in chips. Howard Lederer is heads-up with his opponent on a flop of K 6 5 . Lederer opted to call 9500 on the flop and they see the 9 fall on the turn. Both players checked to see a free river card, which was the 7 . Both players checked again and Howard announced that he had two pair. His opponent then turned over K 5 from his hand, but Howard turned over K 6 A Q , good for a better two pair and the pot. Players are now going on a one hour dinner break. Freddy Deeb raised to 4200 and was called by Ferit Gabriellson from the small blind. Hans Varsi three-bet from the big blind and made it 16,800 and both players called. The flop was 10 2 9 and all three players checked. The 5 fell on the turn and Gabriellson bet 40,000, which was only called by Deeb. The river was the K and Gabriellson checked. Deeb asked how much he had left and was contemplating moving him in for his last 30,900. Gabriellson turned over K 10 6 Q , good for top two pair, and the pot. After John Hennigan limped in under the gun, Jonas Entin raised to 4500, which was called by the big blind and Hennigan The flop was 7 5 4 and after the big blind checked, Hennigan led out and was raised all in by Entin. The big blind got out of the way and Hennigan instantly called. Hennigan had A 9 8 6 , which meant he flopped a straight, and Entin showed A A 4 6 , good for aces and the nut flush draw. The 8 fell on the turn, making a flush for Entin, and making the river card meaningless. There was heavy action preflop and four players, including Ben Grundy and John Hansen got 45,000 in the middle, with one player being all in. The flop was 8 10 Q and Grundy instantly moved all in. Another player called for his last 10,000, and after a few minutes of contemplation, John Hanson folded. Grundy showed J 9 7 5 , which meant that he had flopped the nut straight and was up against J J 8 10 as well as A K 10 8 . The J fell on the turn, which meant that AK made a higher straight, but the 4 on the river meant that the other player made a flush, and was good for the pot of over 200,000. Marcel Luske limped under-the-gun, enticing two additional middle position players to just call the blind during the limit level. The player in the cut-off raised, with Luske and the other limpers making the call. Luske led out on the 10 5 2 flop, causing both limpers to fold and the original aggressor to raise. Luske called and checked and called a bet the turn when the 9 fell. The action was the same on the 8 river, and Luske’s opponent flipped over the K K . Marcel mucked his hand. In a six way limped pot, Scott Fischman bet 1,000 on a Q 7 7 flop and was called by Allen Cunningham. Fischman checked the J on the turn, and Cunningham fired 2 orange 1,000 chips across the line. After deliberating and counting his remaining stack, Fischman called. The K fell on the river, and Fischman pushed his remaining 2,200 into the pot, which Cunningham quickly called. Caught in a bluff, Fischman was already beginning to muck his hand when Cunningham turned over the Q 7 for a flopped full house. While his famous poker playing girlfriend Jennifer Tilly made her exit during the limit level, Phil Laak battled with his shrinking stack. 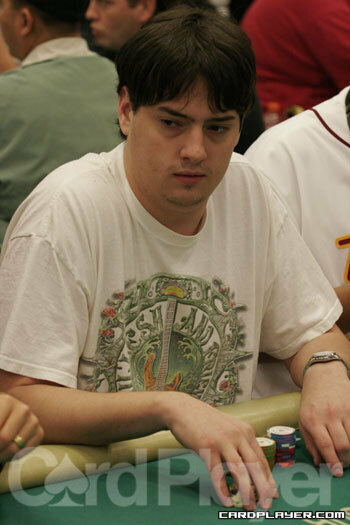 During the no-limit level, Laak pushed all in for 2,075 from the cut-off and was called by Marcel Luske. Laak’s 4 3 was an underdog to Luske’s A 9 , but the K Q 8 flop turned the tables on Luske, who needed to catch a diamond on the turn or river to overtake Laak with a higher flush. Unfortunately for Marcel, black cards fell on both streets and Laak doubled up. Meanwhile, Laak’s friend Antonio Esfandiari built his stack at an accelerated rate. Within minutes of being all in with the K J against his opponent’s A Q and flopping two pair to stay alive, Esfandiari had already busted another opponent and ended the no-limit level with over 25,000. David “Devilfish” Ulliot lost over 25,000 to an opponent by doubling up his K K , and now has less than 10,000 in chips remaining. 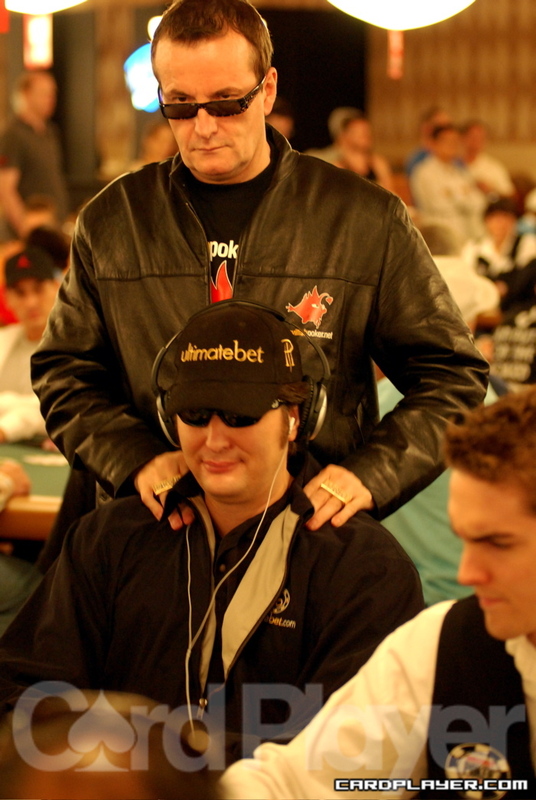 He is currently still seated to the immediate right of Phil Hellmuth. Note: The players took an extended 30-minute break at the conclusion of this level. After his nut flush draw failed to crack his opponents’ top pair, Nick Schulman was left with a total remaining stack of 475 in chips. He threw his stack into the middle on the next hand with AK and was eliminated by his opponent’s pocket jacks. Andy Bloch lost thousands of chips during the limit round over the span of only a few hands. In the first, Bloch raised pre-flop from late position and was called by his opponent in the small blind. His opponent led out on every street of the K J 8 5 5 board, and each time Bloch made the call. His opponent flipped over the K K at the showdown, and Bloch mucked his hand. Within the same orbit, he had doubled up another player at his table. After the two hands, he was left with under 14,000. After raising from late position and being called only by his opponent on the button, Antonio Esfandiari led out on the 4 3 3 flop and was raised. Esfandiari made the call, and let out again when the 2 fell on the turn. Again he was raised by his opponent, this time for all of his chips. Esfandiari made the call and flipped over the A J which was behind his opponents’ Q Q . The 6 on the river completed Esfandiari’s flush, improving his stack to slightly over 6,000. Phil Hellmuth led out from the big blind on a flop of J 8 3 and Amit Makhija called all in with the remainder of his chips. The player on the button raised, and Hellmuth made the call. Phil checked the 6 on the turn and mucked when his opponent bet. Amit flipped over an unimproved K Q against his opponents’ Q J . The blank on the river sent Amit to the rail empty-handed. After calling a raise in the big blind from a middle position player, Allen Cunningham checked a J T 6 flop. His opponent bet, and he called. The 4 on the turn caused Cunningham to bet, and his opponent elected to fold. The pot boosted Allen’s stack to just under 15,000. Hoyt Corkins accumulated a total stack of over 10,000 in chips by utilizing his aggressive style during the limit round. On one hand, Corkins raised pre-flop from early position and was flat called by the opponent on his left. The two players saw a flop of 6 4 3 . Corkins bet, his opponent raised, Corkins reraised, and his opponent finally called. Hoyt followed through by betting the K on the turn, generating a fold from his opponent. Erick Lindgren took down a pot worth over 1,000 in the final minutes of the last no limit round by snapping his opponents’ bluff on a board of K Q 9 3 2 . Lindgren flipped over the A Q and his opponent mucked his A J face up. Lindgren now has over 10,000 in chips. 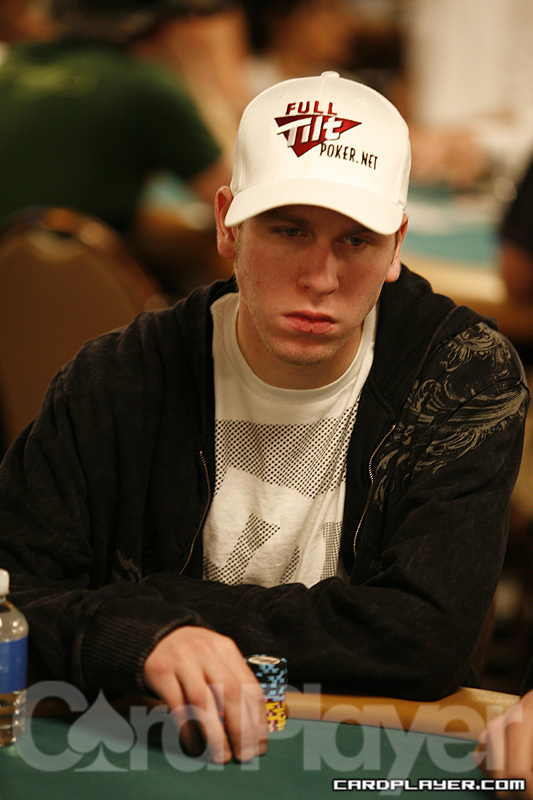 During the second level of limit play, Cory Carroll raised from the cutoff and was re-raised by Andrew Robl on the button. Carroll called, and the dealer laid out a flop of 6 8 9 . Carroll checked, Robl bet, Carroll check-raised, Robl three-bet, Carroll four-bet to a total of 800, and Robl called. The turn brought the K , Carroll bet 400, Robl raised him yet again, and Carroll called. The 5 appeared on the river, and once again Carroll led out only to be raised by Robl. Carroll called, and Robl flipped over A 7 . Carroll mucked, and Robl takes down a juicy pot. Nick “The Takeover” Schulman recently joined table 1, joining Vanessa Russou, David Chu and John Hennigan. It took little time before Schulman and Rousso tangled. 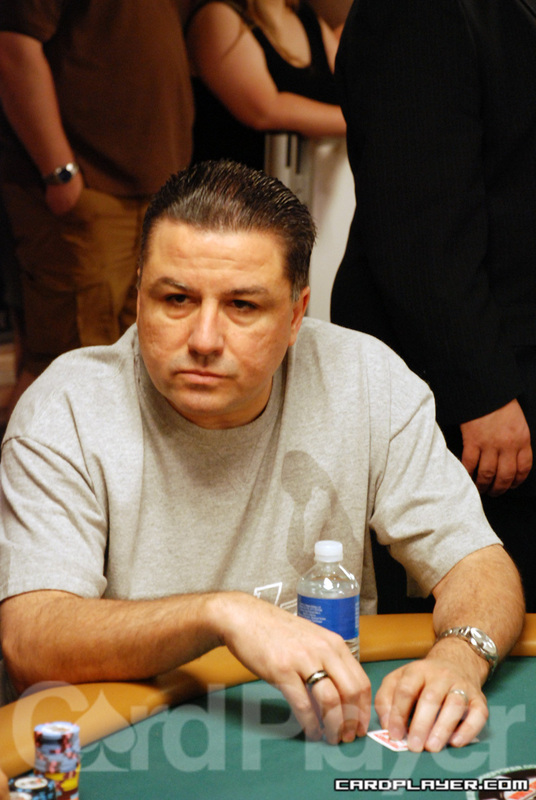 On a board of K 9 8 , Rousso checked to Schulman, who tossed a purple 500 chip across the line. Rousso folded, leaving her with over 12,500. After that hand, Schulman had just under 10,000. 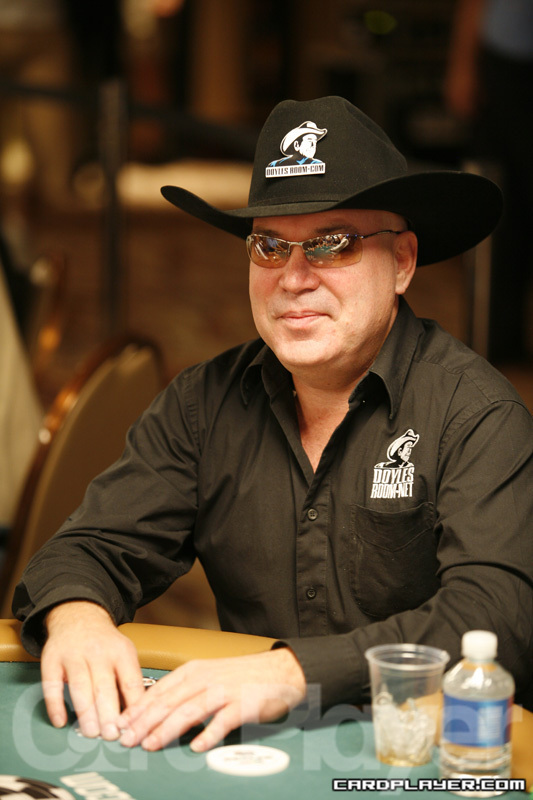 Dewey Tomko has taken Daniel Negreanu’s spot next to Bill Edler, Isabelle Mercier, and Doyle Brunson. In the big blind, Antonio Esfandiari called a pre-flop raise from a middle position player. The flop was J 10 8 , prompting Esfandiari to bet and be raised all in by the initial aggressor. Esfandiari called with Q J , having his opponent well covered. His opponent flipped up two black kings, and the 7 turn, 5 river failed to improve Esfandiari. He now has just over 5,000 in chips. Facing a raise to 325 from the button during the no limit round, Jeff Madsen opted to defend his big blind. Both players checked the J 6 7 flop, but Madsen led out with 450 on the 9 turn. His opponent raised an additional 700, and Madsen called. The river brought the 8 . Madsen fired 2,300, and his opponent called. Madsen announced that he had missed his draw and turned over the A 9 . His opponent revealed his 8 5 , and his straight was good for the pot. On a board of 3 K Q , Bradley Berman check-raised pot and then shipped the rest of his stack in when Lyle re-raised him. Brad held A T for a flush draw and gutshot straight draw while Lyle flipped over 3 3 for bottom set. The turn and river came 2 and 8 . 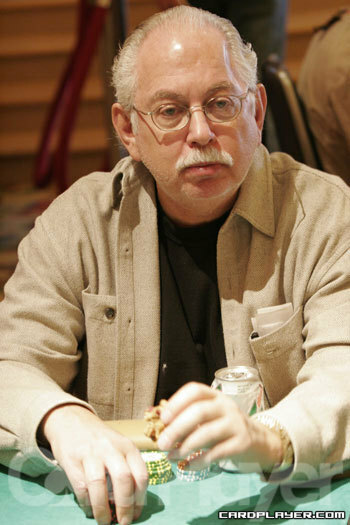 After the hand Berman had roughly 70,000 chips. After the first two players to act limped in for 1,600 Phil Ivey raised to 8,800. Jonathan Little then reraised to 23,900 in the small blind. The first limper folded quickly and then after a couple minutes the second limper folded as well. Ivey immediately moved all in for only 3,000 more. Little called with pocket queens and Ivey flipped over AK. The board came A 7 J 8 7 and Ivey doubled up to roughly 55,000. Little dropped down to around 30,000. Newton bet 21,700 with the board reading 7 9 6 6 and Ben Grundy called. The A came on the turn and both players checked. Newton flipped over T 6 for three sixes. With the pot Newton's chip stack was now roughly 190,000. 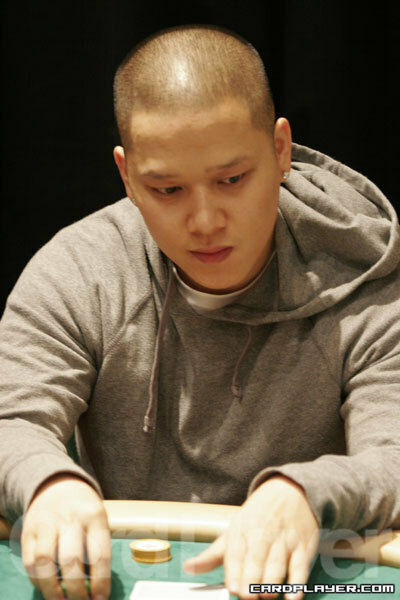 Tuan Le in the big blind was the second of two players to call a raise to 4,800. The flop came down K 4 A , and Le made a bet of 16,000 before being raised by an all-in shortstack who had 18,400. The J on the turn and J on the river didn't change matters, Le winning with A 6 , topping his opponents K Q . Le moved to 170,000 in chips. Ben Sprengers put himself at risk with a big move against tournament chip-leader Tony Licastro. On a flop of 9 J 6 , Sprengers made a pot-sized bet of 64,900. Licastro debated before Sprengers called for a clock. Time ran out, and Licastro showed his folded A K . Sprengers jumped to 140,000 in chips. With a pot of over 10,000 and a board of J 5 3 , Phil Laak and his seat 6 opponent both checked the 8 as it fell on the turn. When the river brought the 7 , Laak made a bet of 7,800, which caused his opponent to fold. This pot increased Phil's stack to over 150,000. The war between Laak and this opponent was far from over. After limping, Laak folded to his opponent's raise. Ben Grundy has raised several hands in a row at his table, including one confrontations with Chris Moneymaker. After making it 4,000 from middle position, Grundy faced a call from the player on the button and Moneymaker in the big blind. All three players checked the 9 4 2 flop. Moneymaker fired 6,200 from first position when the turn brought the 4 and received no calls. His stack improved to 33,000. Moneymaker was eliminated shortly after. On a board of K J 5 Q 9 , Eli Elezra checked to Vivek “psyduck” Rajkumar. Rajkumar thought for a minute before inquiring, “Is a set any good?” and betting 8,000 into the pot of about 12,000. Elezra thought only momentarily before calling and turning over JT. Vivek, true to his word, showed QQ for a set of queens and mucked. Elezra was boosted to 90,000. Rajkumar's setback proved to be only temporary, as he fought back to regain a big stack (180,000). With a board of Q K 5 J 5 , Ben Grundy reluctantly called a bet of 15,000. As soon as his chips hit the felt the small blind mucked his hand. Grundy scooped up the pot and increased his chip stack to roughly 135,000. From the big blind Ryan Young check-called a bet of 5,700 on a flop of 6 3 3 After the 9 came on the turn, Young checked and then called a 15,000 bet. The river was the 4 and Young again bet. This time is opponent checked and Young sheepishly flipped over pocket 3s. Ben Sprengers of Florida made a major leap forward in a span of three hands. Playing from late position, Sprengers raised to 4,000 and was called by the button. On a dangerous flop of A K 9 Sprengers fired out a bet of $17,000. He was called, which resulted in Sprengers checking the turn when the 8 struck. The button also checked. The river brought the 10 , and Sprengers fired out a bet of 32,000. The button called. Sprengers rolled over the T 8 for running two pair, while the button revealed the K Q . Two hands later, Sprengers increased his stack to 125,000 when his pocket kings busted a short-stacked opponent. David Benyamine increased his stack to 128,000 when his pocket aces crippled an opponent with pocket kings. The double-paired board of J 8 5 J 8 didn’t scare either player. John Juanda raised to 3,800 from middle position. 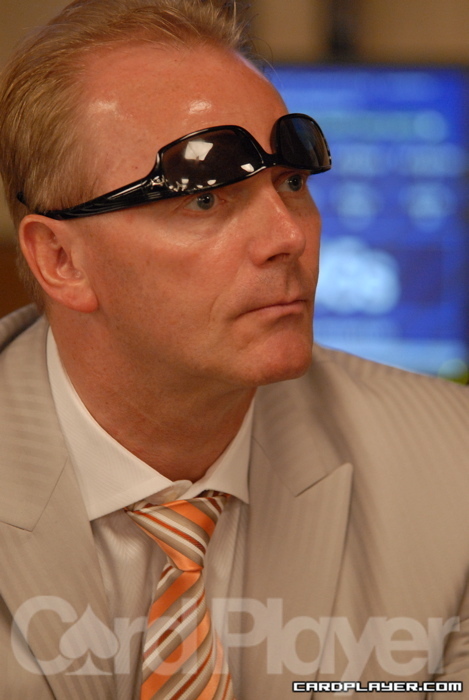 A player in late position called and Mark “Newhizzle” Newhouse came along from the big blind. On a flop of K 9 3 , Newhouse checked to Juanda, who bet 7,200, the late position player folded and Newhouse called. After a 5 came on the turn, Newhouse check-called a 14,600 bet. Both players checked the river and Newhouse took down the pot with K Q . On a board of K Q 2 7 4 , Kevin “BeL0WaB0Ve” Saul checked to Isaac “Ike” Haxton who bet the remainder of his stack – 17,000 – into a pot of 30,000. Saul thought for a few moments before calling, only to muck quickly after Haxton flipped K T for top pair. The hand strengthened Haxton to 65,000 and dropped Saul to 84,000.